Israeli forces rounded up 6,489 Palestinians, including scores of women and children, in the occupied West Bank and Gaza Strip this year, according to official estimates. A total of 1,063 minors and 140 women were among those arrested in 2018, the Palestine Liberation Organization's Commission of Detainees and Ex-detainees Affairs said in a statement on Saturday. According to the statement, Israeli authorities have issued 988 administrative detention orders this year. Estimates show that the sweeping majority of Palestinians arrested this year were from the West Bank, while only 5 percent were from Gaza. The Israeli forces frequently carry out wide-ranging arrest campaigns across the occupied West Bank and Jerusalem on the pretext of searching for "wanted" Palestinians. According to Palestinian figures, some 6,500 Palestinians continue to languish in Israeli detention facilities. Taken away from their children, dozens of Palestinian women are suffering abuse in Israeli prisons, according to Palestinian activists. 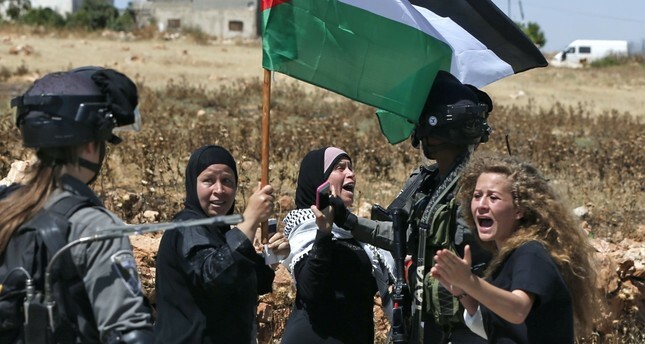 In a recent report released in October, the Addameer Prisoner Support and Human Rights Association said the Israeli authorities hold 51 women. Israeli treatment of Palestinian children in military detention has become a major area of concern for the international community. International human rights groups have heavily criticized Israel's handling of Palestinian teen hero Ahed Tamimi, placing under scrutiny the Israeli military court system that Palestinian youth face in the West Bank. Tamimi was freed after an eight-month detention, but some 270 Palestinian children continue to be imprisoned and are subjected to poor treatment by Israeli jailers. According to a report released in July by the Palestinian Prisoners Center for Studies, there was a 30 percent increase in the number of children arrested when compared to the same period in 2017 when 380 children were arrested by Israeli forces. The Israeli army has killed 25 Palestinian children in the occupied West Bank and the blockaded Gaza Strip since the beginning of 2018, a human rights nongovernmental organization said in July. In a press release, Defense for Children International-Palestine, which advocates for the rights of Palestinian children in the Israeli-occupied Palestinian territories, went on to assert that Israeli forces had deliberately killed minors with live ammunition. The Great March of Return began when hundreds of thousands of Palestinian demonstrators converged on the buffer zone separating Gaza from Israel. Israel has responded to the rallies, still held every Friday, with deadly force, killing more than 220 Palestinians and injuring thousands more. Israel was criticized by a U.N. human rights body for its killing of protesters in Gaza and for its treatment of Palestinians, declaring it a "war crime" under the Statute of Rome. The high casualty toll triggered a diplomatic backlash against Israel and new charges of excessive use of force against unarmed protesters.